The results are in, said Catherine Rampell in WashingtonPost.com, and to the surprise of no sane economist, 2017’s huge “Republican tax cut is a big, fat failure.” Last year, supporters of President Trump’s epic “giveaway to corporations and the rich” insisted the cuts would “pay for themselves” by unleashing such growth that, even with lower tax rates, tax revenues would zoom upward. Instead, figures released this week show the deficit jumped by a whopping 17 percent in 2018, to $779 billion—and is projected to top $1 trillion by 2020. In Republicans’ defense, said Paul Krugman in The New York Times, “they never actually believed that the tax cut would be deficit-neutral.” The GOP has been pulling the same “starve the beast” trick for decades: cut taxes for the rich and corporations, then use the resulting deficits “as an excuse to hack away” at social programs. Right on cue, Senate Majority Leader Mitch McConnell this week pooh-poohed the idea that the Republicans’ massive tax cuts might have anything to do with the massive widening of the deficit, claiming “the real driver of the debt” is spending on “entitlements”—that is, Medicare, Medicaid, and Social Security. The dishonesty is breathtaking. The Trump tax cuts haven’t paid for themselves, said Stephanie Kelton in Bloomberg.com. But they have supercharged the economy, and the Congressional Budget Office estimates that over the next decade the cuts will boost GDP by 0.7 percent annually, lower unemployment, and lift wages across the board. Given these benefits, is an increased deficit really “something to be up in arms over?” As for McConnell’s comments, said Ramesh Ponnuru in NationalReview.com, Democrats spent all week twisting them into a fiendish Republican plan to gut entitlements if the GOP retains control of Congress. In fact, McConnell said explicitly that the political pain that comes with entitlement reform makes it “difficult if not impossible to achieve when you have unified government,” and that cutting such spending must be a bipartisan effort when Democrats regain some power. Give McConnell points for candor, said Jordan Weissmann in Slate.com. He just admitted what everyone has known for years: “The GOP doesn’t actually want to fix the deficit while it’s in charge.” The message to next week’s voters could not be clearer: Elect Democrats, because according to the Senate majority leader himself, the effort to curb our ballooning debt is hopeless “unless Democrats can take some of the blame for it.” If Democrats do regain the House or the Senate, said E.J. 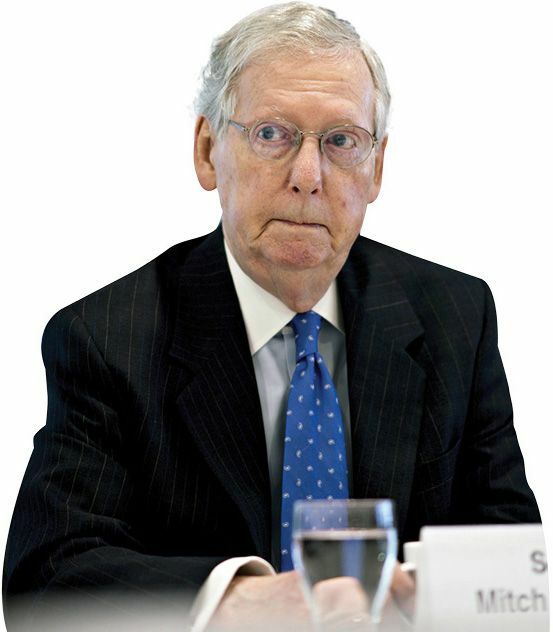 Dionne Jr. in The Washington Post, McConnell and his party will be “reborn yet again as fiscal scolds.” Deficits will once more become an “existential threat,” requiring steep spending cuts in any program helping the poor and working people.